The circus arrives without warning. No announcements precede it. It is simply there, when yesterday it was not. Within the black-and-white striped canvas tents is an utterly unique experience full of breathtaking amazements. It is called Le Cirque des Rêves, and it is only open at night. But behind the scenes, a fierce competition is underway--a duel between two young magicians, Celia and Marco, who have been trained since childhood expressly for this purpose by their mercurial instructors. Unbeknownst to them, this is a game in which only one can be left standing, and the circus is but the stage for a remarkable battle of imagination and will. Despite themselves, however, Celia and Marco tumble headfirst into love--a deep, magical love that makes the lights flicker and the room grow warm whenever they so much as brush hands. True love or not, the game must play out, and the fates of everyone involved, from the cast of extraordinary circus per-formers to the patrons, hang in the balance, suspended as precariously as the daring acrobats overhead. Written in rich, seductive prose, this spell-casting novel is a feast for the senses and the heart. Praise for THE NIGHT CIRCUS: "The Night Circus made me happy. Playful and intensely imaginative, Erin Morgenstern has created the circus I have always longed for and she has populated it with dueling love-struck magicians, precocious kittens, hyper-elegant displays of beauty and complicated clocks. This is a marvelous book." -- Audrey Niffenegger, author of The Time Traveler's Wife "If this novel is just cotton candy, it's cotton candy spun from strands of edible silver...With no more lust than a late volume of Harry Potter, Morgenstern manages to conjure up a love story for adults that feels luxuriously romantic. When Celia calls their circus a 'wonder and comfort and mystery all together, ' she could have been talking about this book." --Ron Charles, The Washington Post "A Romeo and Juliet tale drenched in magic realism, The Night Circus defies both genres and expectations. In short, it's a showstopper." "Erin Morgenstern's debut novel, The Night Circus, is quietly, enchantingly perfect...reading this novel is like having a marvelous dream, in which you are asleep enough to believe everything that is happening, but awake enough to relish the experience and understand that it is magical." --Newsday "[A] dark and extravagantly imagined debut...The plot follows the separate and then intertwining lives of Celia and Marco, both forced to spend their lives pitting their unusual talents against each other in a cruel competition. But their world is Morgenstern's most vivid creation, a fantastical circus featuring illusionists whose powers transcend mere sleight of hand; like those performers, the author entices her audience to suspend disbelief and rewards its members with captivating pleasure." --People magazine "Morgenstern's exquisitely realized world will have the reader wishing to run off and join this circus." --USA Today "Morgenstern's Circus is the stuff that dreams are made of, and nothing short of a wild ride." --Associated Press "[A] few pages into this story of a mysterious circus and its two stars, a young man and a woman who are both capable of real magic, and you know you are in the presence of an extraordinary storyteller." "Morgenstern's novel feels crafted from the fabric of a dream, and the circus itself never fails to astound. For me, the only real disappointment was that I couldn't buy a ticket." --The Christian Science Monitor "[T]he world of The Night Circus is elaborately designed, fantastically imagined and instantly intoxicating -- as if the reader had downed a glass of absinthe and leapt into a hallucination." --Rachel Syme for NPR.org "Two star-crossed magicians, Celia and Marco, duel for supremacy against the backdrop of a big top unlike any other. Morgenstern conjures up a world of dark enchantment and romance in this dazzling foray into the dreamscape of illusion." --Family Circle "A beguiling, gripping read...Ms. Morgenstern has crafted a thrilling and transporting tale. In so doing she makes it clear that of all the shapes magic may take, storytelling is often the most powerful of them all." "Self-assured, entertaining debut that blends genres and crosses continents in quest of magic... Generous in its vision and fun to read. Likely to be a big book--and, soon, a big movie, with all the franchise trimmings." --Kirkus Reviews, starred review "To enter the black-and-white-striped tents of Le Cirque des Rêves is to enter a world where objects really do turn into birds and people really do disappear...Debut novelist Morgenstern has written a 19th-century flight of fancy that is, nevertheless, completely believable. The smells, textures, sounds, and sights are almost palpable. A literary Mr. Toad's Wild Ride, this read is completely magical." --Library Journal, starred review "This big and compelling first novel ushers in a menacing tone with its first sentence: "The circus arrives without warning...".With appeal for readers not particularly geared to fantasy but who plainly enjoy an unusual and well-drawn story, this one will make a good crossover suggestion." "'Dark as soot and bright as sparks, ' The Night Circus still holds me willingly captive in a world of almost unbearable beauty. This is a love story on a grand scale: it creates, it destroys, it ultimately transcends. Take a bow, Erin Morgenstern. This is one of the best books I have ever read." --Brunonia Barry, author of The Lace Reader "A riveting debut. The Night Circus pulls you into a world as dark as it is dazzling, fully-realized but still something out of a dream. You will not want to leave it." --Téa Obreht, author of The Tiger's Wife "Every once in awhile you find a novel so magical that there is no escaping its spell. The Night Circus is one of these rarities -- engrossing, beautifully written and utterly enchanting. If you choose to read just one novel this year, this is it." --Danielle Trussoni, author of Angelology "Pure pleasure...Erin Morgenstern is a gifted, classic storyteller, a tale-teller, a spinner of the charmed and mesmerizing -- I had many other things I was supposed to be doing, but the book kept drawing me back in and I tore through it. You can be certain this riveting debut will create a group of rêveurs all its own." "The Night Circus is a gorgeously imagined fable poised in the high latitudes of Hans Christian Anderson and Oscar Wilde, with a few degrees toward Hesse's "Steppenwolf" for dangerous spice. The tale is masterfully written and invites allegorical interpretations even as its leisurely but persistent suspense gives it compelling charm. An enchanting read." --Library Journal "This dueling-sorcerers premise brings to mind Susanna Clarke's magnificent 2004 novel, Jonathan Strange & Mr. Norrell...[Morgenstern] employs her supple prose to conjure up a series of wonders: A maze made of clouds, a ship of books floating on a sea of ink, a tent that seems to contain a vast desert." 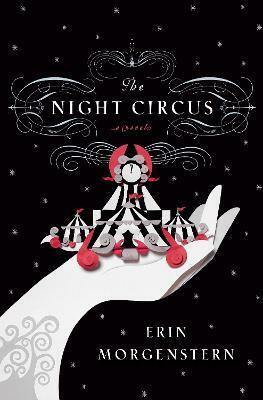 --Salon.com "Erin Morgenstern's The Night Circus is a standout. With echoes of Alice Hoffman (fairy tale magic), Audrey Niffenegger (teleporting) and J.K. Rowling (young wizards, here magicians), Morgenstern's debut is lifted by its poetic writing, winking literary allusions and thematic cohesion." --The Kansas City Star "Erin Morgenstern has crafted a debut that is original and surprising and fitted it with a wonderful conclusion. She's revealed herself as a writer worthy of notice." --The Denver Post "If the preamble -- so aptly titled 'Anticipation' -- doesn't make you sit right down on the floor of your library or bookstore to see what Morgenstern conjures up next, you may not be the right reader for this novel. I'll wager, however, that you will fall quickly under her spell." --Star Tribune "So should you read Erin Morgenstern's debut novel, The Night Circus? The short answer: 'Yes.' The Book is engaging and magical, entrancing the reader every step of the way." --Huffington Post "The circus is a veritable cornucopia of sights and sounds and appetizing scents. It is a fantasia, a fairy tale writ large and come to life." --Slant Magazine "The Night Circus succeeds on a grand scale...Morgenstern's lush descriptions are magnetic, as if conjured by spell. The joy of reading this book is its offer of pure escapism."